Overall, feminists need to work to create a mass-based movement that includes visions and models of what non-patriarchal relationships, norms and society look like. We need to communicate those ideas outside of people we already think agree with us, or are like us. 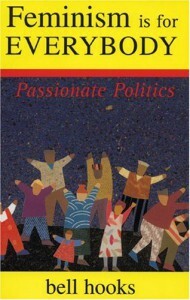 Or, in her own words: "While visionary feminist thinkers have understood our need for a broad-based feminist movement, one that addresses the needs of girls and boys, women and men, across class, we have not produced a body of visionary feminist theory written in accessible language or shared through oral communication. Today in academic circles much of the most celebrated feminist theory is written in sophisticated jargon that only the well-educated can read. Most people in our society do not have a basic understanding of feminism; they cannot acquire that understanding from a wealth of diverse material, grade school-level primers, and so on, because this material does not exist. We must create it if we are to rebuild feminist movement that is truly for everyone."